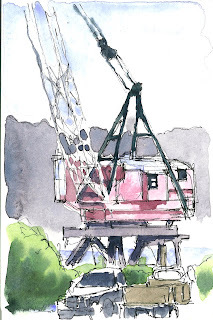 Luckily these guys took a lunchbreak so the crane sat still long enough for me to do a quick sketch. By the way - if anyone's looking for something to do on Saturday night, I have a show of watercolors as part of the Ballard Artwalk - 6-9pm Oct 10 at RE/Max, 1718 NW56th St.
congrats on the show Will! post pictures of the show her in case we can't make it!